TUSTIN, CA, November 13, 2018 – AnaJet, a Ricoh company and global leader in the direct to garment (DTG) industry, today announced that it has been named a CES 2019 Innovation Awards Honoree for the newly released RICOH Ri 1000 Direct-to-Garment (DTG) printer. Products entered in this prestigious program are judged by a preeminent panel of independent industrial designers, independent engineers and members of the trade media to honor outstanding design and engineering in cutting edge consumer electronics products across 28 product categories. 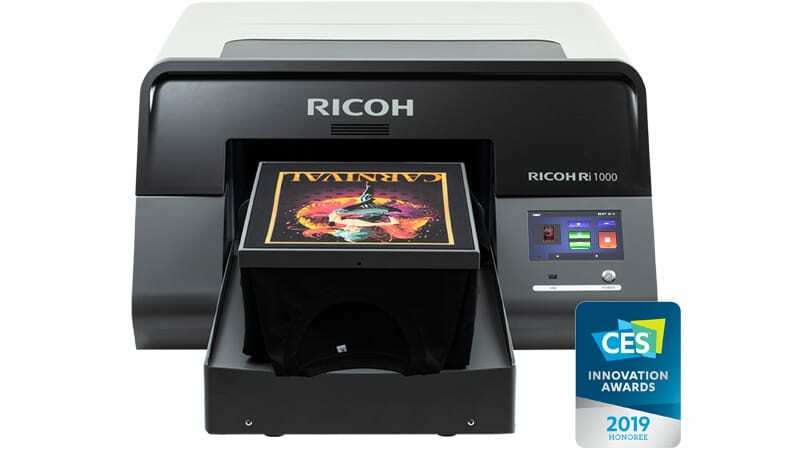 In addition to quick print speeds and high image resolution up to 1200 x 1200 dpi, the RICOH Ri 1000 is a stand-out from its competition because of its “walk-up ready” design. Maintenance for the machine is largely automated, including white ink agitation, self-cleaning functions, and continuous monitoring of ink supply and air levels. For maintenance functions that are not automated, the RICOH Ri 1000’s built-in Interactive Operation Guide alerts users, sending them reminders to complete necessary tasks. The result is a machine that requires minimal maintenance and is kept in an active state, ready to print at any time. For further ease of use and added versatility, the RICOH Ri 1000 also features magnetized quick-change platens that easily snap on and off the machine without the need for additional tools. Quick-change platens in multiple styles and sizes up to 16 inches by 19.6 inches allow for maximum versatility with virtually no downtime between setups. The prestigious CES Innovation Awards are sponsored by the Consumer Technology Association (CTA)™, the owner and producer of CES 2019, the global gathering place for all who thrive on the business of consumer technologies, and have been recognizing achievements in product design and engineering since 1976.
some of the most cutting edge tech products and services coming to market. The RICOH Ri 1000 was announced in the US on October 18, 2018 and is expected to begin shipping to US customers in Winter 2018. International availability will be announced at a later date. The machine will be displayed at CES 2019, which runs January 8-11, 2019, in Las Vegas, Nevada. For details on Ricoh’s full line of DTG printers, consumables, and accessories, please visit www.RicohDTG.com. Press kit, including images of the award-winning RICOH Ri 1000. AnaJet has been a true pioneer in the direct-to-garment printing industry starting with the mass production of its first printer line in 2006. AnaJet became a Ricoh company in late 2016, and the two immediately united to begin research and development on the flagship RICOH Ri 3000/Ri 6000 printers. In 2018, AnaJet launched the ground-breaking Ri 100, which was named a 2018 CES Innovation Awards Honoree. In October 2018, AnaJet released the RICOH Ri 1000, a prosumer machine designed to round out the Ricoh family of DTG printers by offering a full feature set at an affordable price. AnaJet continues to set the bar in the DTG industry, constantly striving to create market-leading products with superior print speeds, reliability and ease of use.